A few years ago I came across a recipe dubbed “Engagement Chicken.” The writer claimed each of her daughters had received long-awaited marriage proposals after making the meal for their boyfriends. I’ve learned how to make a mean chicken, but I don’t think anything in my recipe repertoire would inspire someone to put a ring on it. However, I swear this blueberry breakfast cake helped lead to my first promotion. Let me set the scene. It is 2 a.m. on a cool June morning. We are in a dingy open office, partly below ground, that served as the local CBS newsroom. I am probably wearing a stained black tee with the name of a local bar and grill emblazoned on the chest. (At the time, I was making more as a waitress than a part-time news producer—even if I had to beg the manager to cut me by 1 a.m. so I could “get to my other job.”) I probably smell like ketchup and beer. I am carrying a Tim Hortons coffee in one hand and a change of clothes in the other. A handful of equally sleepy, slightly better-dressed coworkers peck at their keyboards with glazed faces. Meet the overnight news crew. We write for hours, barely speaking, until the giant red clock on the wall reads 04:49:51. Then the noise cranks up and people start running. Pink and white scripts fly off the laser printers. Producers shout last-minute instructions as they race down the hallway. Phones ring. Breaking news. More yelling. Six years and more than a thousand shows later, I still consider it a miracle that any newscast actually makes it on the air; in those final sixty seconds it almost always seems impossible. But back to the breakfast cake. Having been raised on my mother’s fine cooking, I found myself pitying my droopy-eyed coworkers who seemed to subside on protein shakes and Taco Bell. No wonder they looked so zombie-like; they obviously needed real food. Good food. I took it upon myself to provide. By summer’s end, I was exhausted. My harried schedule had taken its toll; I had dropped ten pounds (despite all those cakes and cookies) and could fall asleep literally anywhere. (Sometimes I would stare longingly at a deserted corner booth in the bar, fantasizing about curling up on the sticky black pleather and closing my eyes for just ten minutes.) While driving a deserted I-675 after a particularly frustrating restaurant shift, I remember praying, desperately, I can’t do this any more. Please provide something. After the shows that morning, my boss asked me to follow him into a conference room. I racked my brain for anything I had done wrong. A glaring misspelling on a graphic? Some flagrant factual error? Did I libel someone?? Turns out, the conversation was a speedy answer to my prayer. The station was in the middle of a baby boom and two producers would be on maternity leave at the same time. Would I consider producing the 11 p.m. show for a few months? I wouldn’t get a pay raise, but I could start working more hours a week. “Everyone is raving about you,” he said with a shrug. Never underestimate the power of hard work and warm cake. *Since this recipe included berries, I took the advice of Smitten Kitchen’s Deb Perelman and sought out aluminum-free baking powder. The aluminum can react with the acidic fruit and turn the surrounding batter a sort of bluish-green; it can also make your cake taste a bit metallic. Since I was too lazy to go to the store, I mixed my own, following this recipe. Heat oven to 350°. Generously coat a tube pan with nonstick cooking spray. For streusel topping, mix brown sugar, flour, and cinnamon in a large bowl. Cut in the butter until the largest pieces are the size of peas. (My pastry blender—kind of like brass knuckles for bakers—saved me some time and effort. You can also grate frozen butter into the batter or use your food processor for the same effect.) Set streusel topping aside. 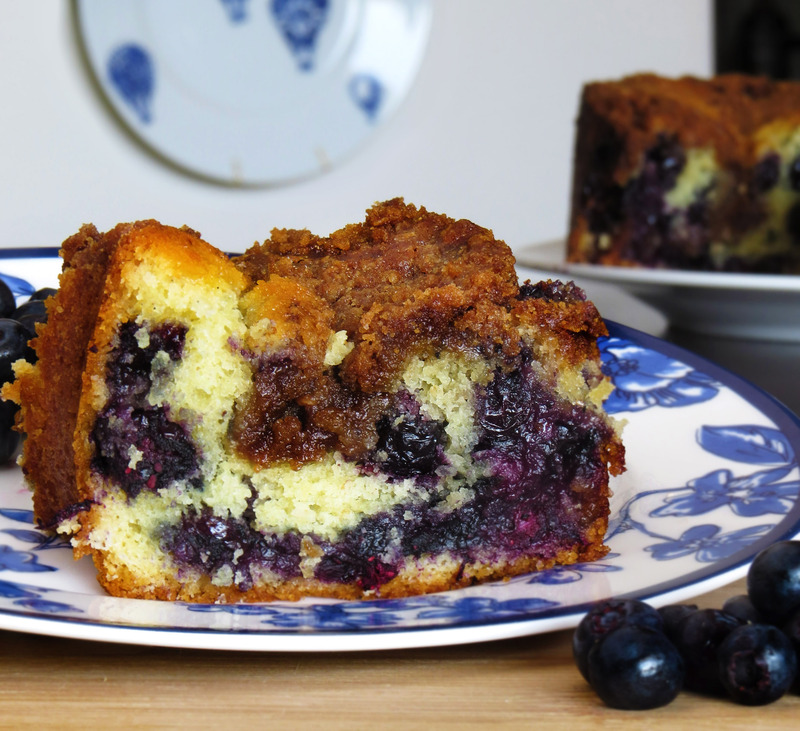 For the cake, beat butter in large bowl until creamy. Add sugar and beat until fluffy. Beat in egg and vanilla. Evenly sprinkle 1 cup flour, baking powder, and salt over butter mixture; beat well. (The original recipe called for sifting dry ingredients in a separate bowl, but I hate dirtying extra dishes and my cake suffered no loss in taste or texture.) Mix in the milk and the final 1 cup flour until batter is smooth. Spread half of the batter in your greased pan. Cover evenly with berries. Add remaining batter, using a rubber spatula to even out the surface (if a few—or even most—of your blueberries are peeking through the top, it’s nothing to worry about). Cover the batter with streusel topping. Bake at 350° for 55 to 60 minutes until topping is a deep golden brown. Let cool for at least 30 minutes before you try to remove your cake from the pan. After 30 minutes, run a knife along the edges of the pan to loosen. Carefully invert onto a platter for serving.